If you own Samsung Galaxy Note 7, please do leave your feedback too. After the success of Galaxy Note 5 that was launched last year in 2015, Samsung is back with it's successor this year in 2016. 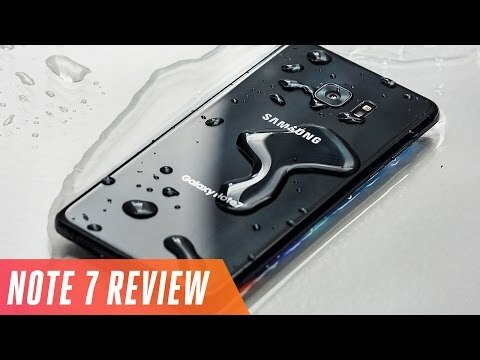 Samsung this time skipped a number and named the new flagship Note 7 instead of Note 6 which might have been because Samsung wanted the Note series to come at par with the S series. In terms of design the Samsung Galaxy Note 7 borrows the looks of the Samsung Galaxy S7 Edge with Corning Gorilla Glass on the front and back of the device and Metal sides which does feel premium in hand but that makes the back of the device fingerprint magnet. Samsung is known to manufacture best display out there and the Samsung Galaxy Note 7 is no exception. The phone has one of the brightest outdoor viewing with 1000nits and the 5.7 inch SAMOLED display has a resolution of 2560x1440 pixels (Quad HD). Samsung Galaxy Note 7 gets the same processor and RAM from the Galaxy S7 Edge, it being the Exynos 8890 Octa Core chipset clocked at 2.3GHz and combined with it is 4GB of RAM. As known from the Galaxy S7 Edge, Note 7 should be a great performer and should handle any task thrown at it with ease. It has a fingerprint sensor on the home button below the display and also sports an Iris scanner on the front of the device that helps you unlock the device with your eye. You also get the S-Pen stylus and while the S-Pen is an additional accessory to handle, there are several features on the device around the S-Pen. Samsung Galaxy Note 7 gets the same cameras from the Galaxy S7 Edge, that being a 12MP sensor on the rear of the device with f/1.7 aperture and on the front is a 5MP sensor for video calling and also selfies. Coming to the storage, with the Note 7 you get straight 64GB of inbuilt storage and expansion option up to 256GB more via a MicroSD card in the second hybrid slot of the device. There is a 3500mAh battery unit sealed inside the device which should be good and should last you a day in most cases and you do get fast charging and wireless charging with the device. For connectivity, the Samsung Galaxy Note 7 supports Dual SIMs if you do not wish to use the second slot for storage expansion. The phone also supports 4G LTE with VoLTE and NFC.